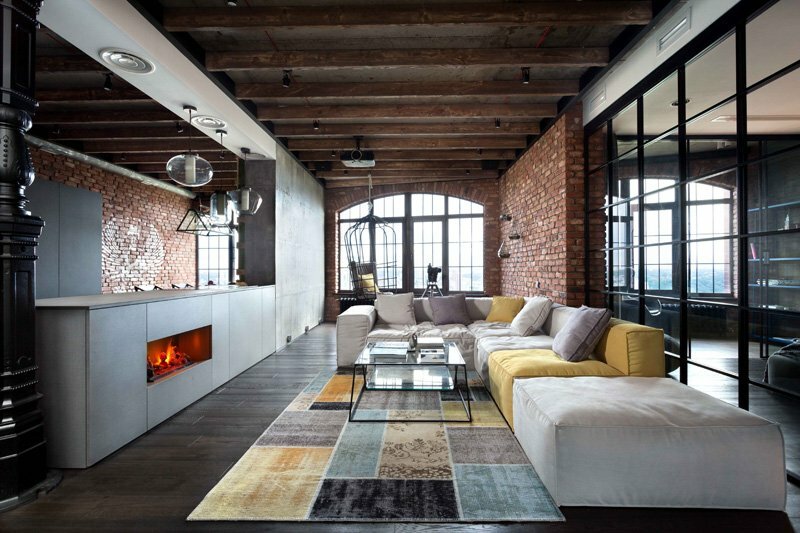 This beautiful loft has a gray color palette with pops of yellow. Great colors for a modern industrial space. Every time I see a loft apartment, I always look forward to how they do the walls. I don’t know why but I find the walls of loft spaces lovely. There would always be an accent wall for spaces like this. Some have a modern geometric design while others use brick walls. Still others add huge paintings to their spaces. I actually find it very interesting. Now, we are going to feature another loft apartment. Expect some lovely decorative features on it once again just like what we saw on other loft dwellings. 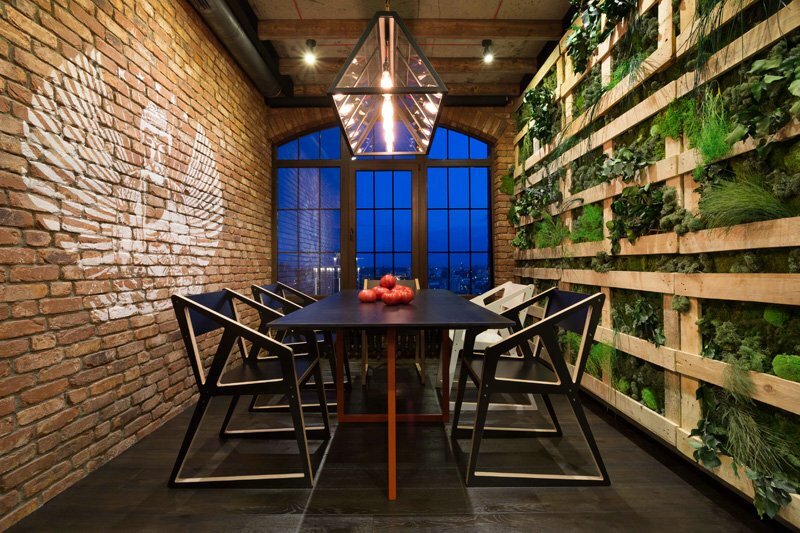 This loft apartment is designed for a young and energetic lawyer in Kiev, Ukraine. He loves to invite friends in his place and play table games. The project has many different characteristic receptions in this loft style space. The space is contained in a new building located in the center of city. The loft features beautiful furniture and elements of decor that were made by Ukrainian masters, companies and designers. The furniture designs of Igor Martin, which were developed for a company HIS (Home Ideas Supply), were first used in this project. One impressive feature of the apartment is its ‘clever house’ system, wherein all the commands are executed through the personal telephone of the owner. Amazing, right? 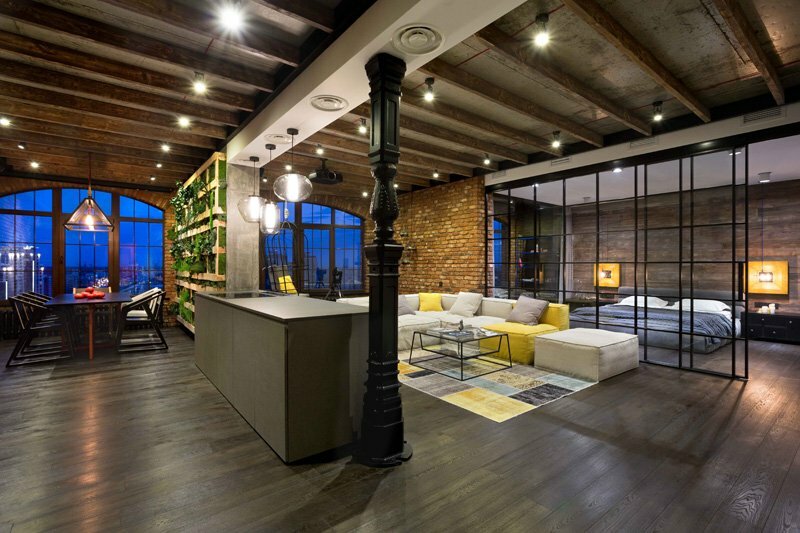 Let us take a look at this beautiful modern industrial loft. Unique feature: The urban dwelling features a gorgeous mix of modern and industrial design. It has beautiful decors and furniture that make up the space. Would you expect that the architecture of this space could actually look very gorgeous like this? Well, nothing is impossible when creative people give a space their magical touch. 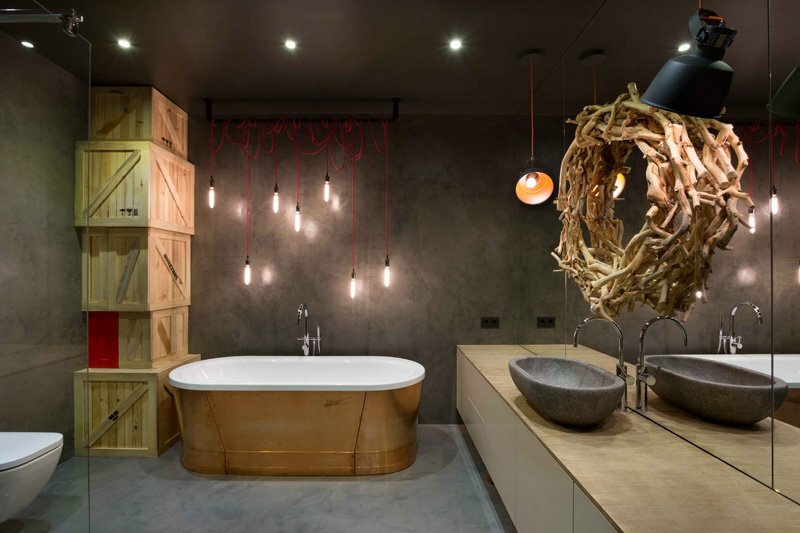 Notice here how the designer put together modern and industrial elements. This is the living room with a gray L-shaped sofa. Yellow colors are asses to this area which bring in more life to it. I know you love that Shaun the Sheep wall print! It adds some childish touch to the living area. The loft has partitions for the dining area, bedroom and living areas. 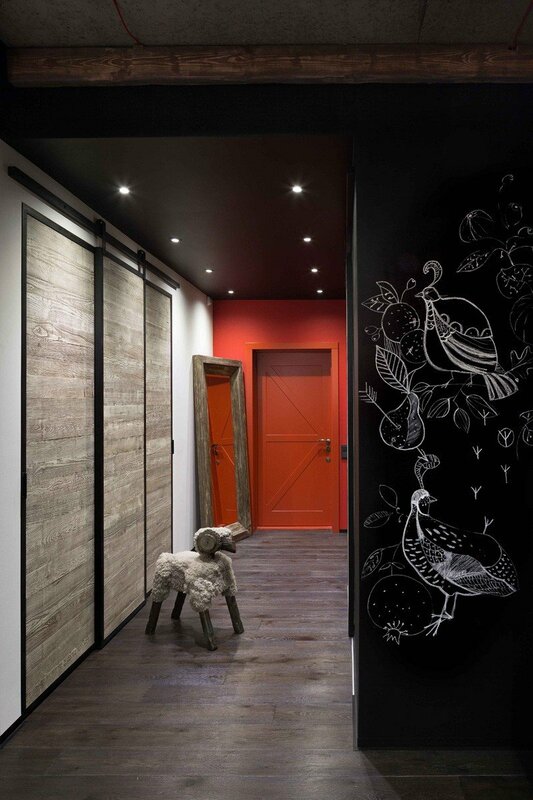 It is interesting that each area used a different partition that made it appear more creative. 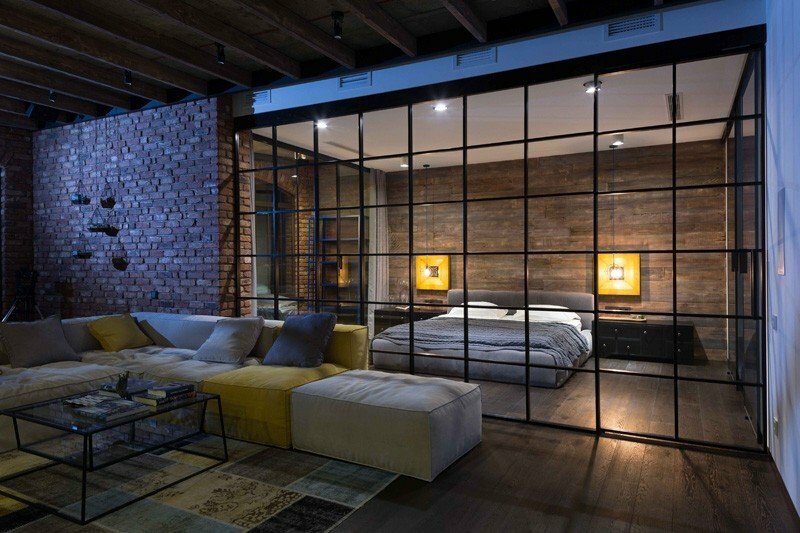 Aside from the brick walls, a sliding glass door with grids is used to define the space of the bedroom while a living wall and island separates the living area and the dining area. What stands in the middle is a beautifully carved black column. From the living room, one can have direct access to the kitchen with gray cabinets and island. The island has a fireplace on inside it which is a good thing. The various shapes of the pendant lights is a lovely feature too. I can remember that we featured a cage hanging chair before. It sure is a whimsical addition to any space. 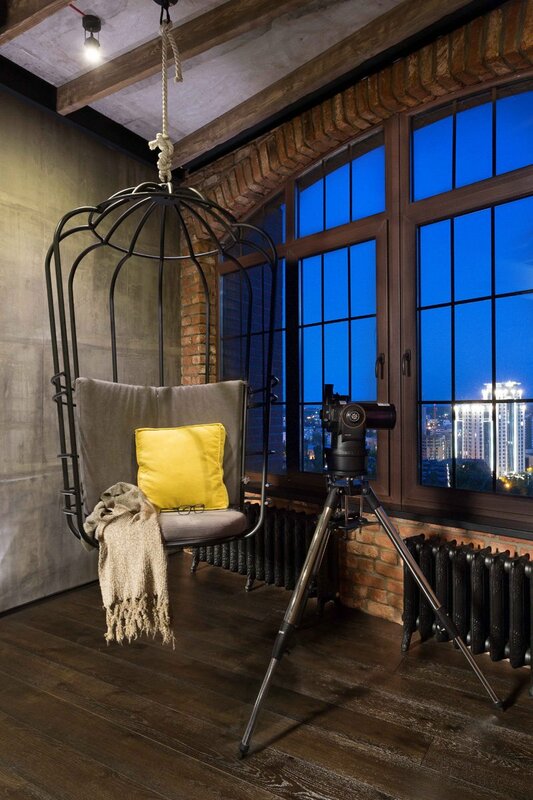 It would be nice to look at the breathtaking cityscape while sitting on this hanging chair. I’m not sure if this part of the wall is chalkboard painted with chalk drawings or is actually just wallpaper. Well, whatever it is, I love this wall! Notice that sheep sculpture too. I can tell that the owner has a thing for sheep. This is the foyer of the loft with an orange door. The dining area used wooden tables and chairs in modern design. But what I love most here is the living wall with wooden pallet frames and a brick wall with a beautiful wall mural in white. Interesting, right? From the living room, the bedroom can easily be seen because of the glass grid on it. I am sure you can notice the use of wood from the flooring to the wall of the bedroom creating a continuous look. 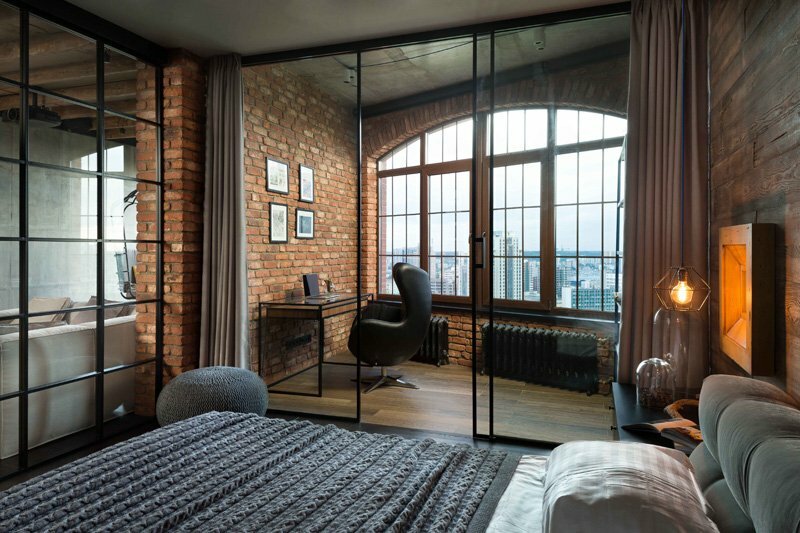 The bedroom connects to a working area that overlooks to the beauty of the city. It has gray color palette too from the need to the curtains and even that ottoman too. I find that yellow show box on both sides of the bed really lovely! This is the working area which is separated from the bedroom with a sliding glass door in black frame. 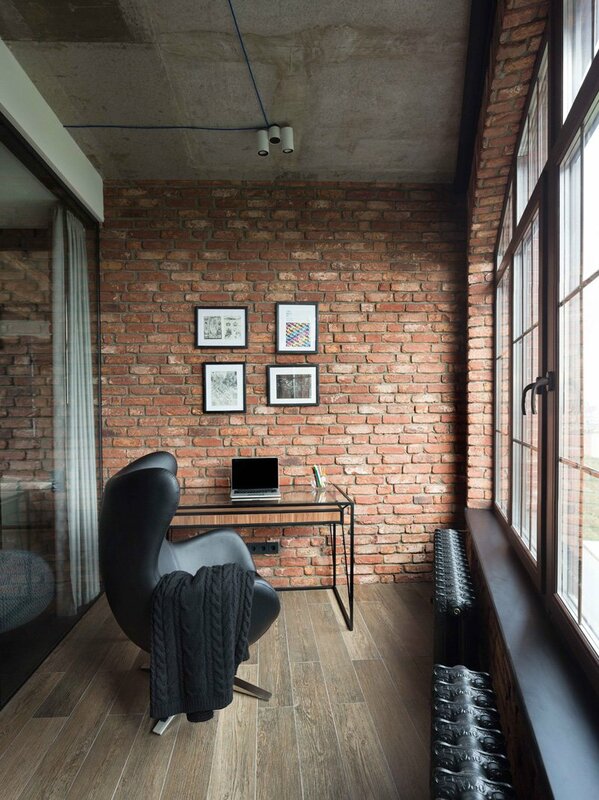 Brick walls are also used here which gives it an industrial feel. It is a good idea to use black furniture for the space. An arch window provides a view of the city. Another view of the working area with a beautiful glass and steel table. Above it are framed black and white photos with black frames that match with the area’s color scheme. Those wooden boxes! It reminds of the Madagascar 2 where Alex and the rest of the gang were contained in theses boxes. I think it is a cool idea to add these to the bathroom along with that wreath made from wood and the lights with red wire. 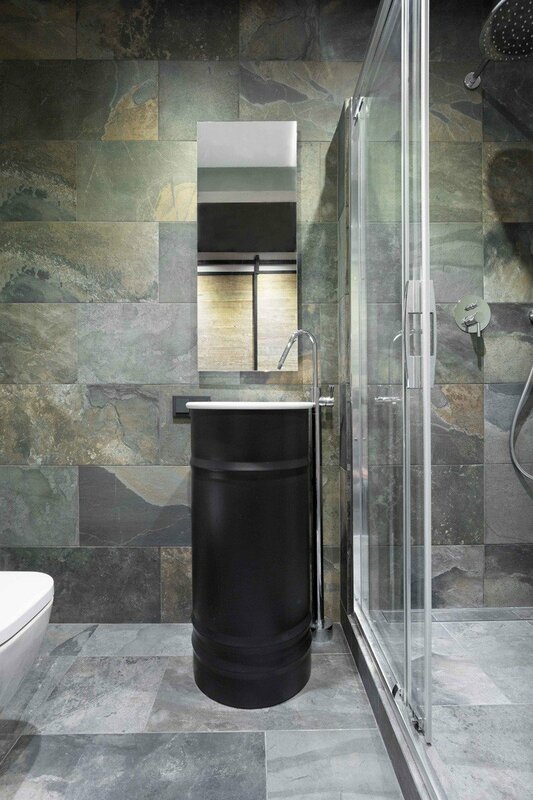 This one is a lavatory that looks like a tall and slim container. Its color and design is just perfect for the theme o the house. 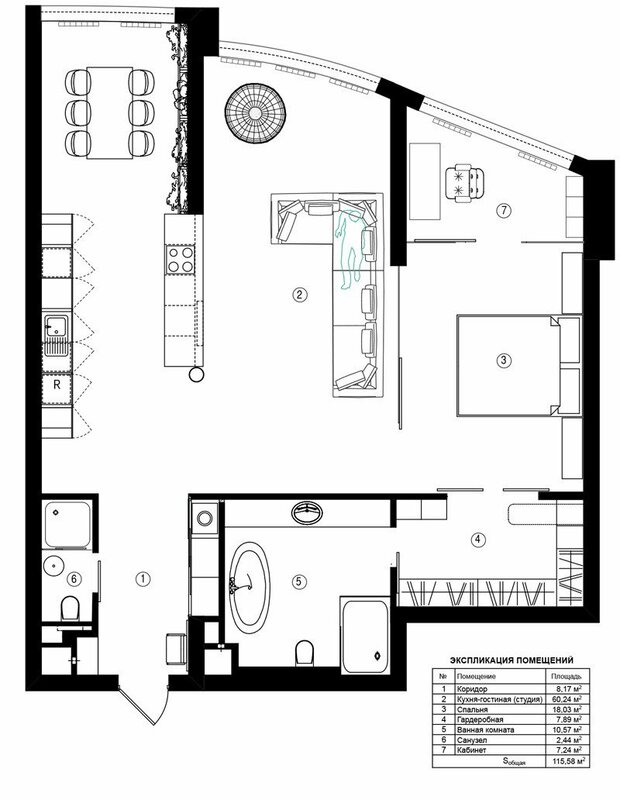 And this is the floor plan of the loft that will give you the idea of how everything was arranged in the space. It isn’t a huge space but it has everything the young lawyer needs. Igor Martin and Olga Novikova of MARTINarchitects worked on this project. I am sure you are impressed of how the loft looks like especially its furniture. 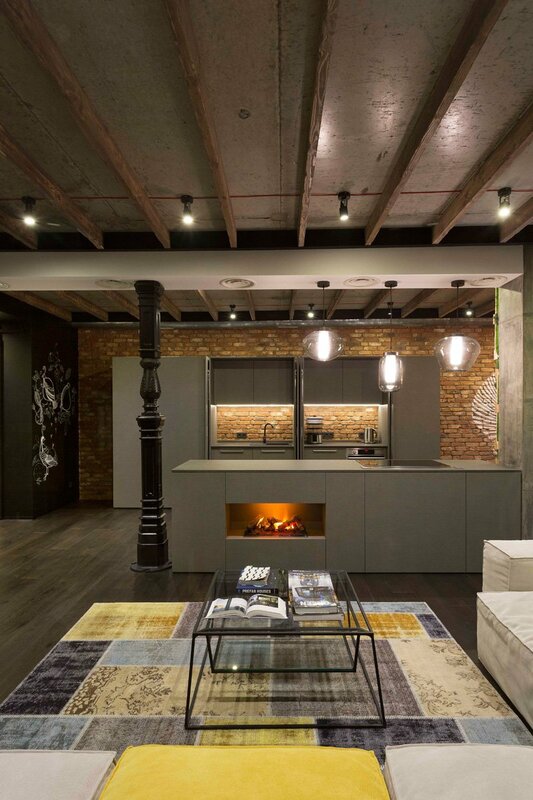 I like how they combined modern and industrial features in the house as well various materials too. The designers certainly did a good job in adjusting the interior design to the existing architecture of the structure. There are many artistic and creative items in the loft too. It has pops of yellow everywhere that looked lovely with earth colors in the space. The overall look of the home is not just relaxing but it is also very inviting too. For sure, the lawyer’s friends would love to visit him and spend time in his beautiful loft apartment.